get your wands, ahem, knitting needles ready! Two new patterns are on their way, just in time for Spring! The Dark Arts Hat & Cowl have everything you want in a Springtime knit. Start with stranded colour work, executed in on-trend hand-dyed mohair & speckled Merino. Finish with a set of Spring accessories that is warm, bright, and unbelievably feather-light. Plus, they're #matchymatchy. Need I say more? This set began with two unlikely yarn companions: a charcoal Merino single with neon speckles, and a rainbow-bright skein of mohair/silk. Two yarns that had been hanging out in my stash for over a year because, honestly, I had no idea what I was thinking when I bought them, and no idea what to do with them. I'd only rarely designed with variegated yarn. And I'd never designed with speckled yarn. And the colours? About as far away from my usual neutrals as you could get. But I was determined to make them work. So...I took my knitting needles, practiced a little swatch alchemy, and magically transformed two very "not me" yarns into a "totally and completely me" set that I am so very proud to share as an original COLD COMFORT design. Well, here we are, it's 2019! I sincerely hope that 2018 was good to each and every one of you. If it wasn't exactly your year (I know it wasn't my best, lol), I hope you'll join me in looking on the bright side: New Year = New Beginning. Personally, preparing to welcome 2019 caused me to pause and reflect on 2018; the ups, the downs, the lessons learned. At times the process was deep. At times it was just plain entertaining! For example, the Instagram "Best Nine". Am I the only one who loves this little end-of-year 'tradition'? I can't be! It's always so fun--and surprising--to see your own best nine, and others', too. For @coldcomfortknits, 2018 was a very yellow year! If you already follow me on IG, THANKS! Thanks for all the love. Thanks for a great year! If you're on 'the gram' and want to start following me there, my handle is @coldcomfortknits. I've already got new designs on my needles for 2019 so, if you can bear to put down your knitting needles for a moment (no judgement if you can't), I hope you'll follow me here and/or on IG to stay "in the loop". I have a feeling 2019 is going to be a wooly good year! The second of two designs created in collaboration with The Fibre Co.,The Weston Tweed Wrap is an epic, oversized, giant-bear-hug of a wrap, just waiting to be knit for you or someone you hold dear. Inspired by my British heritage, and my deep love for all things wooly, these mitts pay homage to my beloved grandfather. A Canadian soldier in WWII, he “charmed” my Basingstoke-born grandmother—all the way back to frigid Manitoba! ​That first winter, I like to imagine he’d have given her a pair of mitts just like these. After all, no matter the generation, there’s just no denying the special kind of warmth found in a pair of hand-knit woollen mittens! 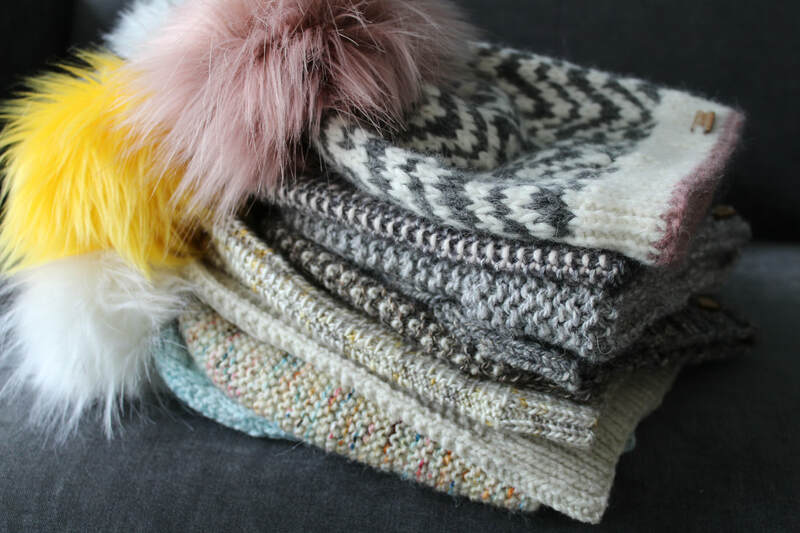 ten original hat patterns inspired by the warmth of friendship; your best friend forever deserves a hand-knit hat!